I ran my 4th Half-Marathon yesterday! 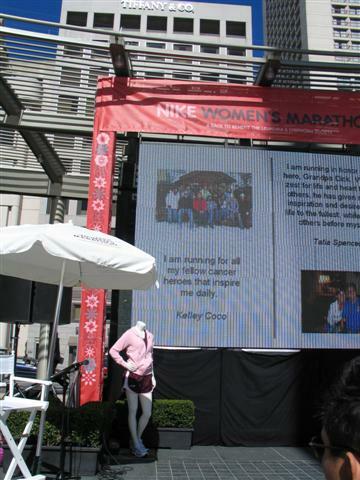 It was the Nike Women’s Half Marathon in San Francisco. I had been training and looking forward to this race since last year! I was lucky to have gotten an entry through the lottery because it sold out in just four hours! I usually get really nervous for races, but I wasn’t at all for this one. I knew I was trained and ready, and that was a new and welcomed feeling for me. This was going to be the first race that I would run without any friends, without my camera and without a team. I knew it would be a mental challenge, rather than a physical one, but I was really excited. On Friday night, Irving and I left Los Angeles at 11:30pm to drive up to San Francisco. We got into the city at 4:30am. We took a nap till about 9:30am and then I took the subway into the city to visit the Race Expo. Those of you who run know that this is the best part of marathon weekend! I got my goody bag, chip and bib, and then I set out to get all the fun freebies (luna bars, ghiaradelli chocolate, postcards, chapsticks…). I also had my nails painted at the “Jet Blue Manicure Station”. And after that, they gave us cute little beauty kits with an eye mask and stuff! I love being a girl. They had really pretty race colors this year! 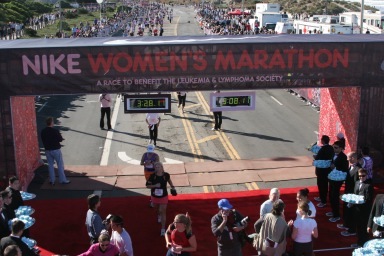 YAYYY… T minus 15 hours til race time! It took me forever, but I finally found my name on the runner’s wall. I love the feeling of being one of “the runners”. I’m in the cool club now! 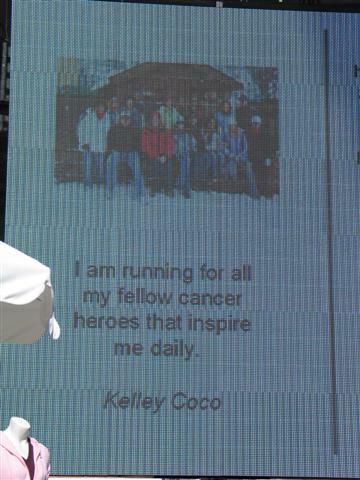 On the big screen at the expo, they had a power point presentation about “reasons why we run”. I wrote about all my fellow cancer survivors at the Little Star Foundation and how they inspire me! I also watched some of the panel speakers there. Joan Benoit Samuelson was there, and it was really amazing to see her run. She’s a legend. 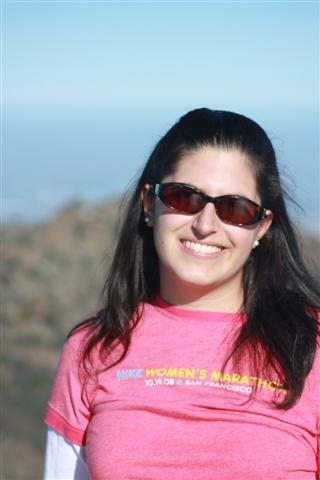 She’s the only American woman to have ever one an Olympic gold medal in the marathon. It was really great to hear her enthusiasm for the sport. I also saw Lauren Fleshman, who is an Olympic Marathon runner. And guess who else was there? Picabo Street, the Olympic Downhill Skier! That was neat to hear her too. After the expo, I met up with some friends in and around the city, and had a nice carbo-loaded pasta dinner! I attempted to get to bed early, but didn’t end up sleeping til about 11:30p. My friend Scott! He works for Team in Training! Doesn’t she look like an athlete? Athletes wear wool sweaters, right?!?! On Sunday, I woke up bright-eyed and bushy-tailed at 4:30am! I was ready to ATTACK this race. haha. I got to the city around 6am, bag-checked my coat and found my place at the starting line. It was freezing! I think in the 40s, but the energy was buzzing all around me. 23,000 of my closest friends were all lined up and ready to run. The hardest part is standing around waiting to go. It took me 27 minutes just to get to the startline. But once I started going, I felt great. 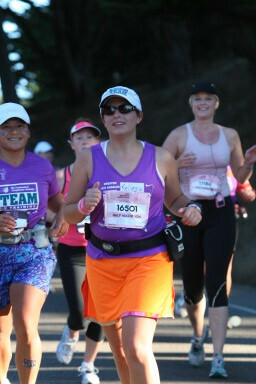 This is my 3rd year running this race, so I really had my heart set on breaking my time. That’s what kept me going throughout the race. The first mile always starts off walking because there’s so many people you don’t get very far. It takes a few miles to thin out. There were a few brave souls cheering us on in the dark. I ran for the first mile and half straight and I felt great, but I knew I had to slow down if I wanted to make it the whole way. My GPS finally kicked in around mile 2 or so. So now I can officially keep track of my pace. We were running along the piers, the sun was coming up, the water was beautiful. More people started coming out to cheer. A lot of Team in Training people were getting the runners excited. My knees started hurting me a bit, I think it’s my shoes… but I tried to ignore it and distract myself. I knew the big hill was coming up, so I just wanted to get through the half way point. The big hill! I walked most of the hill, as fast as I could. I didn’t want to use my energy by running it. It wasn’t that bad, although I always forget how long the hill really is. I saw my friend, Scott, on the sidelines cheering us on! The Team in Training staff was all dressed up in Halloween costumes, so I knew I was on the lookout for “Colonel Sanders”. And there he was up on the hill, holding is KFC bucket. haha It was great seeing him, and it gave me some more energy to keep going. I’m more than half way there!!!! Somewhere over there, in the residential area, they had orange slices for the runners. IT’S LIKE CANDY!! I love oranges when I run. MMMmmmm… OMG it was so good. hahaha. Then it was all downhill for a mile or so, and I ran the whole way without stopping. My knees were screaming at me, but I told them to shut-up. I called Irving as I approached Mile 10. I knew he was waiting at mile 11 so I wanted to give him a heads up. Now, we were running along the ocean cliffs. It was gorgeous. I could see the finish line straight head, but I still have 3 miles left to go and I have to go ALL THE WAY AROUND… awe. 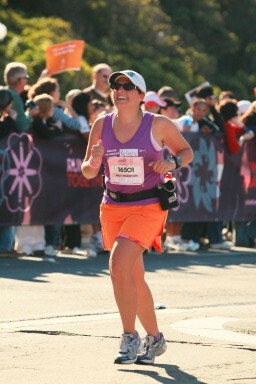 At this point, I realized that if I kept going strong, I would definitely beat my time, so I forged through. I saw Irving at the mile marker, but I didn’t even stop to say hi. I hope he got a good picture as I buzzed by. lol. He gave me a high five. but I Must.Keep.Running. Now, we were in Golden Gate Park, which is where the full and half marathon splits off from each other. Up until this point, we were all running together. I wanted to walk sooo bad… but I knew if I took a walk break, I’d never be able to start up again. So I switched to 2/1 intervals. Running two minutes, walking one minute. Actually, doing this made me run faster than if I was doing 3/1 intervals. I kept up this pace until mile 12, and then I knew it was the final stretch. Can’t miss my orange skirt! I ran for about a half mile straight and blew past the Ghiradelli station (yes, I turned down free chocolate!) My legs were burning, so I walked for a minute or two, and started up again. In order to beat my time now, I knew I had to finish the last ½ mile in under 16 minutes…. I was TOTALLY going to beat my time. As I rounded the bend, only .2 miles left to go, I could see the finish line. 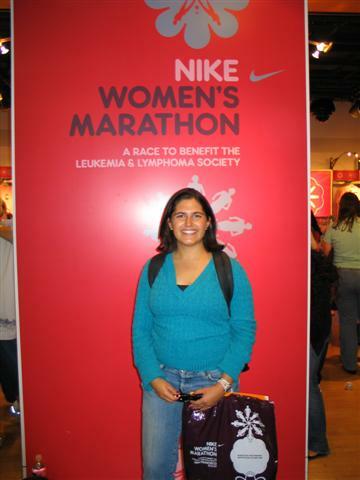 MILE 13: I charged forward, tears welling up in my eyes. Oh.MY.GOSH! I really did it! I beat my time. YAYYY!!!!!! I’m such a rockstar. I picked up my Tiffany’s necklace and my finisher’s t-shirt and a few snacks and met up with Irving and his mom. 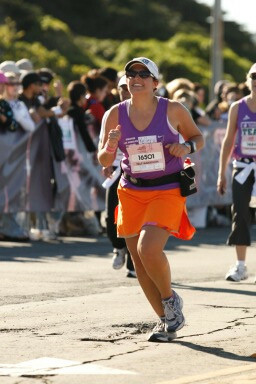 They got some cool pics of me crossing the finish line, so that was exciting. I’m glad they were there to witness my personal victory. I was pretty psyched. 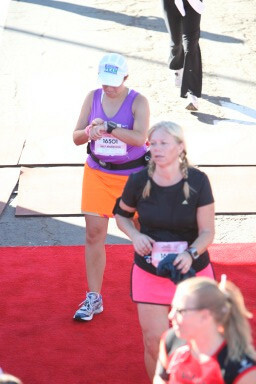 Hahaha.. Me, double checking my time as I cross the finish line! This is why I run. The hot guys in tuxes with blue Tiffany’s boxes on silver platters! I love this picture. 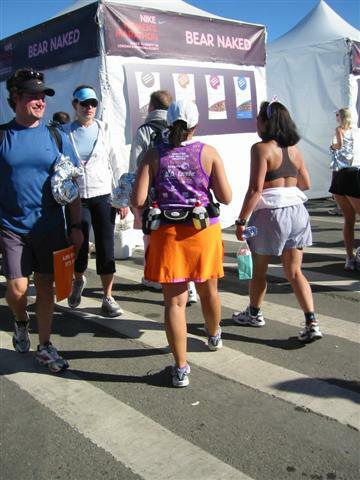 Tiffany’s bling… the man I love… and a new 1/2 marathon record. 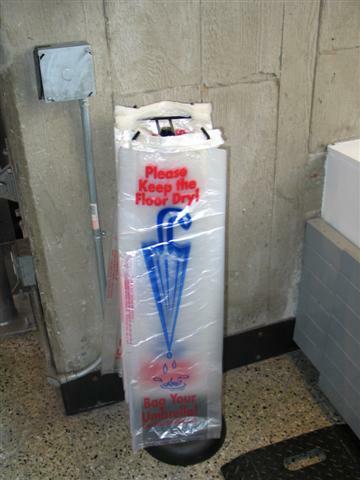 Picking up my bag from the bag check area. After walking… I mean shuffling back to the car, we headed over to get burgers for lunch… Mmmm Burgers…(I burned over 2,600 calories in the race, so I didn’t feel bad lol!) So good! We all took a 2 hour nap in the afternoon, and other than a few stiff joints, I was feeling great. It was a really fun race, I cant believe how fast it came and went. I’m already looking forward to next year!